SAN DIEGO —San Diego made a push in 2007 and 2008 to remind those navigating the Pacific Ocean in large recreational vessels Los Angeles is not the only destination in Southern California for superyacht and megayacht owners to dock for a few days while traveling to Alaska or Mexico. The campaign for multimillion-dollar yachts to moor in San Diego Bay started to materialize when port officials launched a trial program in 2008. Megayachts would be allowed to moor along San Diego’s embarcadero with the promise of a myriad of services for 100- and 200-foot vessels visiting the harbor. Services included concierge and boat maintenance. 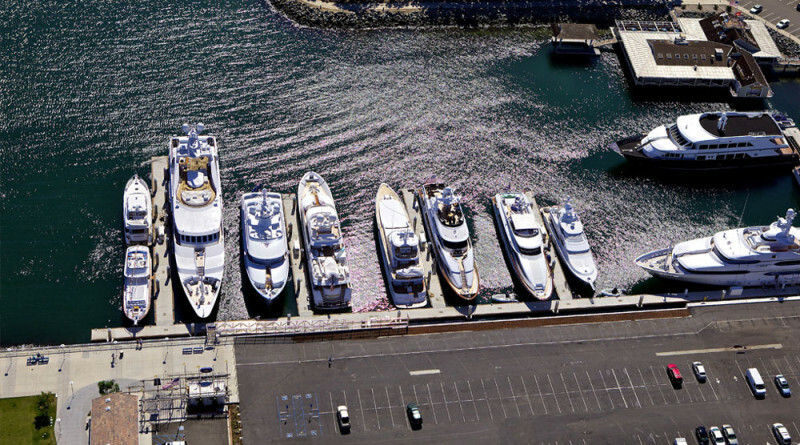 Fast forward to 2015 and superyachts and megayachts appear to have a steady presence in the harbor, with a few docking at Fifth Avenue Landing in downtown and San Diego Mooring Co. offering docking opportunities for 100- to 300-foot yachts. The port’s campaign appears to be yielding positive results, according to a boatyard representative and yacht broker. San Diego Superyacht Association (SDSA), a collective of business executives, marinas, and superyacht brokers, builders and designers, was launched in 2006. Members included representatives from Driscoll Boat Works, Fraser Yachts, Kona Kai Marina, Marine Group Boat Works and Shelter Island Marina. “The group’s mission is to promote San Diego as a world-class superyacht destination and provide a conduit to marine services and suppliers,” port staff stated about SDSA. SDSA’s mission appeared to materialize in 2007 as the Port of San Diego campaigning for superyachts and megayachts to visit the harbor began. 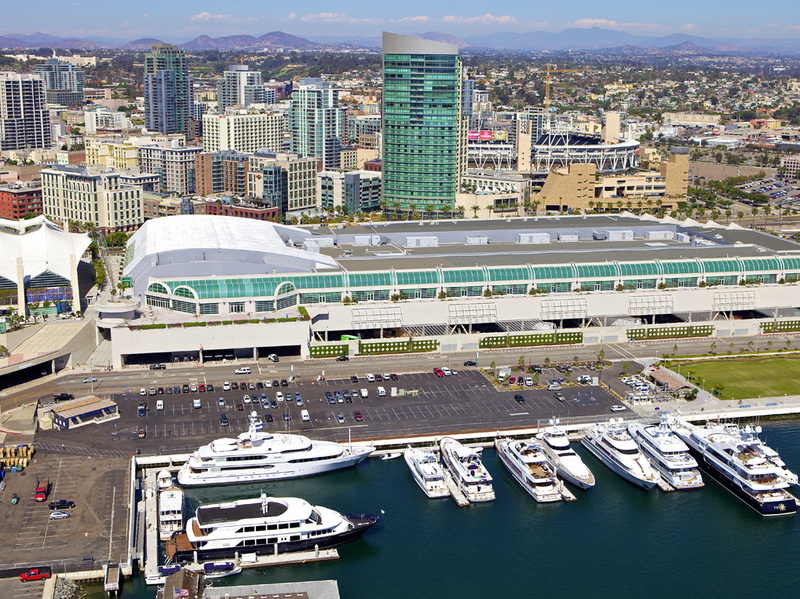 The Port of San Diego’s Board of Port Commissioners granted San Diego Mooring Co. a two-year lease to manage megayacht moorings the following year. Princess Mariana was the first megayacht to dock in San Diego Bay; the six-deck, 225-foot yacht docked Mediterranean-style at the embarcadero in August 2008. After the economic downturn an assemblyman from Carlsbad introduced legislation to make it easier for large recreational vessels to visit California’s ports. Gov. Jerry Brown signed the bill into law in 2012, making it easier for superyacht and megayacht owners planning to visit San Diego (among other ports) to submit an oil spill prevention and pollution plan to the state. Fraser Yachts’ Neal Esterly said the port’s efforts to market San Diego as a destination for superyachts and megayachts is yielding results, particularly for vessels passing through the region while en route to Alaska or Mexico. “There is no noticeable growth of superyachts based in San Diego, but … there is an increase [in large yachts passing through]. It’s growing bigger,” Esterly said. He added San Diego is attractive to superyacht and megayacht owners for several reasons. The city, for example, features an accessible international airport and yards such as Marine Group Boat Works in Chula Vista capable of servicing large projects. Having the Navy and hi-tech companies in town means the right technology is available for most work. Available dockage at reasonable rates and cooperative government agencies are among the reasons San Diego’s position as a destination for large yachts passing through the area has met with positive traction, Esterly said. “It’s a team effort between private industry and the government to keep boats coming. Marine Group Boat Works’ spokesperson Leah Yam echoed similar sentiments, saying San Diego Bay is large enough to handle superyachts and megayachts. Yam said the distinction between superyacht and megayacht is evolving. The type of vessel qualifying as a “superyacht” has grown since the turn of the century, while “megayacht” was not widely used until recently, Yam explained. “If you were to ask me 15 years ago, I would’ve defined a superyacht as being about 85 feet or greater and there was no such thing as a megayacht. Now I’d categorize a superyacht as being about 100 feet or greater and a megayacht would be 200 feet or more. The terms are still evolving,” Yam said. The term “gigayacht” could be the next term commonly bantered about from the large vessel lexicon, according to staff at Warsash Superyacht Academy (a division of Southampton Solent University in the United Kingdom). Gigayacht could apply to vessels larger than 100 meters (about 328 feet). Marine Group Boat Works serviced more than 60 vessels measuring larger than 100 feet in 2015, according to Yam. Visiting San Diego, be it during major events or while en route to points due south, north or east, each large yacht coming into the bay impacts the local economy, according to Esterly and Yam. “These boats are a floating economic stimulus,” Esterly said. A 200-foot yacht typically employs a crew of 10 or more people, according to Warsash Superyacht Academy staff. Food supplies for the crew during multi-day navigations are usually bought during stopovers in San Diego. Captain and crew would rent hotel space or housing if the superyacht or megayacht is being serviced. Yam said superyacht and megayacht owners support employees at boatyards and bring revenue to fueling stations, restaurants, retail and local housing. One superyacht, for example, could spend tens of thousands of dollars on one trip to Costco, stocking up on provisions for everyone aboard a long voyage south or west. Yam cited an example of one captain renting out two homes in coastal San Diego for his crew. Each home was rented out at $15,000 per month for three months, she said, infusing nearly $100,000 into the San Diego economy. There are no recent economic impact reports to validate how much money is put into the San Diego economy courtesy of visiting superyachts and megayachts. A 2007 Marine Group Boat Works press release citing industry estimates stated for every $1 spent on repairing or maintaining a superyacht meant $7 was invested locally on entertainment, hotel rooms, restaurants and shopping. Superyachts and megayachts also bring an aesthetic value to the local landscape, according to Yam. She said superyachts and megayachts are well-received by San Diego’s recreational boaters. A few superyachts and megayachts are regularly spotted at Fifth Avenue Landing in the downtown area, which advertises itself as a “12-slip boutique San Diego superyacht marina” capable of serving 300-foot vessels. San Diego Mooring Co. and GB Capital Holdings LLC currently advertise the city’s waterfront as an ideal destination for yachts between 100 and 400 feet in length. Berthing rates start at $75 per day ($2,250 per month) for a 100-foot superyacht to $225 per day ($6,750 per month) for 300-foot megayachts. The mooring company charges $150 per hour for loading and unloading of equipment and provisions.